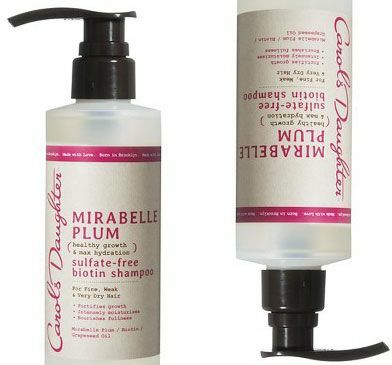 When I first heard about the new Mirabelle Plum line from Carol's Daughter, I wanted to get my hands on it--immediately! Upon reading the descriptions and ingredients in this new line, I felt as if the folks at Carol's Daughter went inside my brain and created this line just for my needs. I wanted to try these and NaturallyCurly was super kind and provided me with three of the products (I bought the oil myself) to review and I'm happy to report after using these products for a few weeks, not only was I not disappointed - but I have a new obsession and some new Holy Grails that I already purchased backups of, too. After having success and enjoying the last line from Carol's Daughter I tried out, The Marula Oil Line, I was eager to try the Mirabelle Plum. The scent of this line is okay... But the effectiveness of these products for me is so worth it I don't think I'd care if the line smelled like broccoli! The scent of this line is okay. I don't hate it but I also don't love it the way I love the scents of the Marula Therapy or Black Vanilla lines from Carol's Daughter. I would describe the smell being uniquely fruity with a minty or herbally twist to it. I don't find the smell to be severely overbearing, though it does have that perfumey aspect to it. But the effectiveness of these products for me is so worth it I don't think I'd care if the line smelled like broccoli! What They Say: FOR FINE WEAK & VERY DRY HAIR. We want the best of both worlds: a shampoo that deeply fortifies and hydrates and encourages healthy hair growth. Spoil yourself with this sulfate-free shampoo that instantly replenishes hair’s natural moisture as well as revitalizes the hair follicles. Mirabelle Plums are at the heart of a nourishing fusion of oils that intensely rehydrates fine, weak and very dry hair so it’s more manageable and easily detangled, while keeping strands strong and durable. Finally, you can pamper your hair with a gentle cleanser that does it all. Powerful ingredients at work: Mirabelle Plums, Biotin, Grape Seed Oil, Aloe Leaf Juice, and Sweet Almond Oil. What I Say: The consistency of the shampoo is thick and syrup-like to me. It does lather significantly for a sulfate free shampoo. A little goes a long way so my bottle will last forever. I make sure to really massage the ingredients into my scalp (hi hair growth) and leave it on a minute or two. When I rinse this, my wet hair in the shower does feel nice and clean but also kind of stiff. During my first use, this concerned me. Once I followed up with the conditioner however, all was right in my world again. Because of how it leaves my hair stiff, I try not to run this shampoo to the very (damaged) ends) of my hair more than once every other week. What They Say: FOR FINE WEAK & VERY DRY HAIR. Who doesn’t want the best of both worlds? Get it with this rich, creamy conditioner that deeply restores moisture and promotes hair growth. Its nourishing power instantly leaves hair softer and shiner. Mirabelle Plums are at the heart of a nourishing fusion of oils that intensely rehydrates fine, weak and very dry hair so it’s more manageable and easily detangled, while keeping hair strong and durable. Finally, you can pamper your hair with a conditioning cream that does it all. This is one of the most richest, thickest, creamiest regular rinse out conditioners I ever tried in my life! WOW!!!! What I say: This is one of the most richest, thickest, creamiest regular rinse out conditioners I ever tried in my life! WOW!!!! I already have back-ups of this and hope a bigger size comes out in the future. The one con is although this is incredibly rich and creamy, I feel as if I am going through it rather quickly. I use about 6 pumps each time I condition with it, versus only one pump of the shampoo. I will leave this in my hair anywhere from 2 minutes up to an hour depending on how much time I have. I can almost never use a regular rinse out conditioner as my deep conditioner, I always prefer masques, but I can use this conditioner on its own and feel confident my hair is getting the moisture and nourishment it so badly craves. I have been using this sometimes on its own and sometimes mixed with masques and it does play well with others. I had no problem detangling with this conditioner and it left my hair feeling so soft and moisturized. I massage it through the lengths of my hair for a few minutes while detangling. I also use 2 pumps on wet hair as a leave in conditioner, concentrating on the ends. I really believe this is actually helping to change the dryness of my hair for the better. I'm blown away with how much I adore this conditioner. What They Say: FOR FINE, WEAK & VERY DRY HAIR. We deserve the best of both worlds: a leave-in conditioner that restores hair’s natural moisture and encourages healthy hair growth. Go ahead, spoil yourself with this lightweight moisturizer that detangles, strengthens and revitalizes hair follicles. Mirabelle Plums are at the heart of a nourishing fusion of oils that intensely rehydrates fine, weak and very dry hair so it’s more manageable and easily detangled, while keeping hair strong and durable. Finally, you can pamper your hair every day without weighing it down with this refreshing spray that does it all. Powerful ingredients at work: Mirabelle Plums, Biotin, Grape Seed Oil, Aloe Leaf Juice, and Sweet Almond Oil. What I Say: I don't use this leave in on my wet hair. As mentioned because my hair is super dry and this winter has been miserably cold and dry, I prefer the regular conditioner for that purpose. HOWEVER this is my new favorite refresher spray! I use this on day 2 and 3 hair and it adds shine, helps frizz, and leaves my hair feeling soft and looking more manageable. Because it is lightweight, it is nourishing my hair without weighing it down or giving me a heavy product feel, especially after applying and reapplying every day. I like the idea too that I am infusing the ingredients of this line into my hair daily even without washing, so my hair will hopefully become stronger and healthier with consistent use (again, I only tried it a few weeks at the point of writing this review so I can't speak of the long term results yet) This is a rebuy and rebuy and rebuy for me. What I Say: FOR FINE, WEAK & VERY DRY HAIR. We want the best of both worlds: a deeply hydrating treatment that preps hair for a non-stripping cleansing and fortifies hair so it reaches its healthiest state. Treat yourself to both with this natural oil and butter fusion that restores and softens hair without weighing it down. Mirabelle Plums are at the heart of a nourishing fusion of oils that intensely rehydrates fine, weak and very dry hair so it’s more manageable and easily detangled, while keeping hair strong and durable. Finally, you can pamper your hair with this easy-to-use pre-poo that reduces detangling time and much more. Powerful ingredients at work: Mirabelle Plums, Biotin, Grapeseed Oil, Aloe Leaf Juice, and Sweet Almond Oil. Like the rest of this line, I really like knowing every time I use this I am combating my two biggest hair concerns: growth and dryness. At least for my hair (remember everyone's hair is different) I think Carol's Daughter knocked it out of the park with this line. 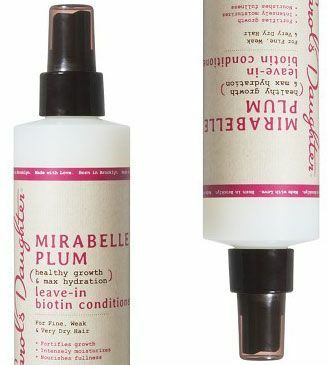 I'd love to see a super hydrating and strengthening Mirabelle Plum hair gel and or butter in the future. Note: This article is not sponsored.